"Chaya is my one shop solution for gifts, quintessentially Indian but work well with people from different cultures.Most satisfying was my recent order of the tanjore worked frame of dance mudras was done beautifully, on time, packed very nicely & within the budgets we agreed on"
"The beautiful 5ft X 4ft Ananthapadmanabha is the pride of our living room in Mumbai. The entire process has been a seamless & happy experience.There is more that we want from you soon." "Chayas paintings have an old-world charm & ethnic feel, among the best we have seen. Our paintings arrived in the US in perfect shape. Thank you CHAYA for your professional and outstanding work"
"Congratulations for bringing a beautiful store to Chennai which displays the rich heritage and artistic handicraft of India. I wish CHAYA all the very best and hope this space will showcase the master pieces of great artists, since Smt Champa Kumar herself is an artist and connoisseur of great repute." "The reason I buy the work of Chaya is because of the clarity in work and the facial features. The gods look so divine." "Like the fact that its handled by two generations...an interesting combination of youth and experience....Very personalized at the same time professional...Plenty of clarity in ....one knows exactly the expenditure involved while placing orders...Quality of work is very good....Very satisfied customer....All the best!" "Always been fascinated by CHAYA s work. It captures the timeless appeal of Indian deities. Over the years have collected their work avidly." "The paintings arrived safe in Delhi. The packing was done extremely well. I was very happy to see the paintings that had the signature Chaya style. Every one of our friends and teachers were thrilled to receive them and all of them appreciated the clarity and the beauty of the paintings.Thank you so much for your special attention and effort once again." "Excellent tanjore paintings. I bought some recently for a Rotary national event and they were a big hit with every one. 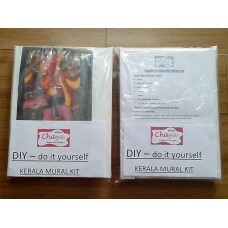 great job and thanks for the prompt delivery of the paintings"
This is a Do it Yourself Kerala Mural Kit. This includes the sketch, canvas, colours , brushes and instructions for an 8x10inch size painting. Kerala Mural Art is a beautiful form of painting, from the region of Kerala, India. The murals found in the temples at Tirunandikam and Tiruvanchikumar are reckoned as the earliest form of Kerala mural paintings, in the 15th century AD. They are also found in the historic rock paintings in the Anjanad valley, Idikki district in Kerala. The traditional art form used vegetable dyes and natural pigments however nowadays we use acrylic colours to replicate the same sketches. The Kerala mural art forms have bright vibrant colours and the figures have a district representation in the way the body structure is done or the eyes are depicted as well. While themes were originally from the epics or religious gods, we now have generic themes, flowers, birds and also in smaller paintings and interesting pot pen holders! 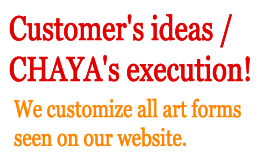 Thank you for your interest in CHAYA products. Please do note, during rush times, it may take upto 2 weeks to answer your query in detail & we thank you for your understanding & patience. 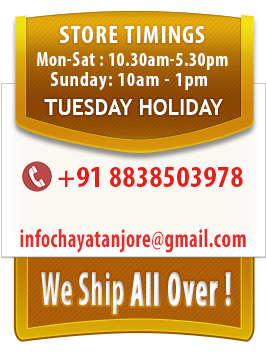 Before filling in the details below, please take a few minutes to go through this LINK to understand the general sizes / pricing for our tanjore paintings. This will help you make a more informed choice. Thank you!